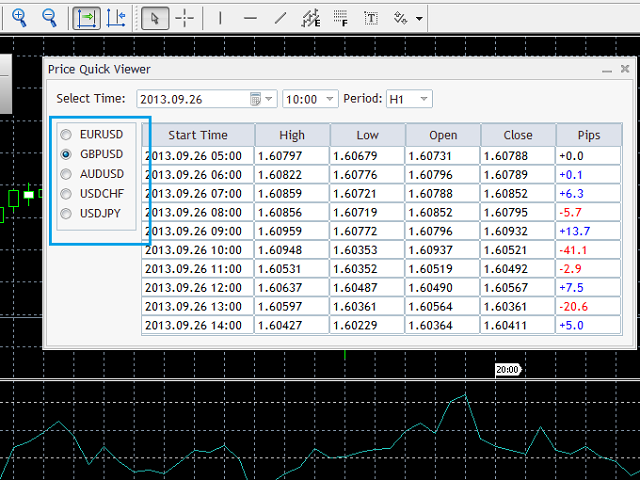 Price Quick Viewer Demo lets you view market price information quickly and clearly. 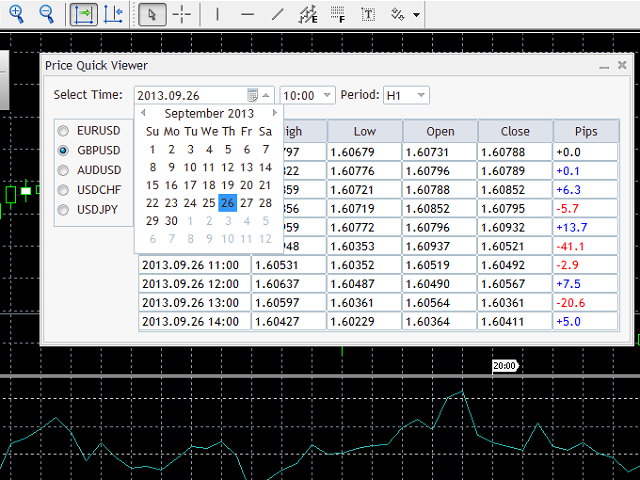 It is a Panel tool for your MetaTrader terminal. It has clean user interface which is very easy to understand. The Demo version doesn't support changing symbol settings from input parameters. If you need to customize the symbol settings, please download and purchase the full version. 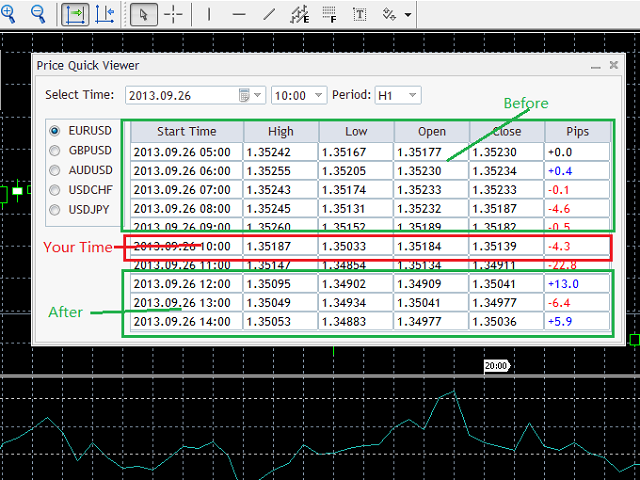 The Demo version is provided here because the MetaTrader 5 Strategy Tester is not suitable to run the panel. You may activate the viewer panel just like running an Expert Advisor. Just double click the "PriceQV_Demo" EA and the panel will be attached to the chart. After the viewer is added on the chart, you may select any time interval in the past and view the price changes in the table. By default, five major currency pairs are supported: EURUSD, GBPUSD, AUDUSD, USDCHF, USDJPY. And you may specify the periodicity of the price change: M1, M5, M15, M30, H1, H4, D1 and W1. In the table, you may see the HLOC (High, Low, Open, Close) price information of the selected symbol before and after the time interval and the price changes in pips (calculated by close price). The tool is very useful if you need to analyze the price changes before and after an event or special time. And switching between different symbols is very convenient. If you select a time in the future, only the latest price information is displayed. If the chart is too small or most area of the chart is occupied by other indicator windows, the panel could be minimized. Displayed time is your trading server time, which could be different with your local time.